Author joanAnewbeginningblogPosted on August 30, 2017 June 19, 2018 Categories UncategorizedLeave a comment on Home brew – Gygax’s ’83 Red Box – Bargle, the renegade wizard. 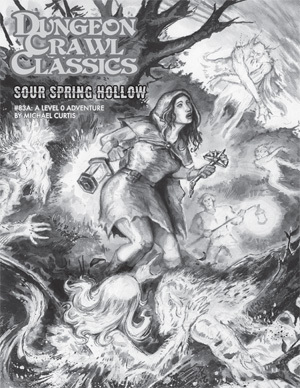 Last evening was the test run/practice session at my FLGS for GenCon 50 of “The Woeful Tale of Sour Spring Hollow” by Michael Curtis from The Chained Coffin box set published by Goodman Games for their Dungeon Crawl Classics RPG. My DCC RPG table is an open table. Meaning that anyone can come and play. I just love teaching new players! And of course, my FLGS loves me introducing new players to the game. Last evening, Aug 12, 2017, I had 10 players come to the table. Yes, I know, the table is best at 5-6 players. But I can’t and won’t turn away new players. Five were brand-new to DCC RPG. I LOVE when new players come. I get so excited to teach them how much fun DCC RPG is! I’m a new Judge and player myself, so I look to learning from the group also. In last evening’s episode, 40 PCs were rolled up. I could have given them pre-gen characters but really, what fun would that be for new players wanting to learn how to roll up new PCs? I just love rolling up new PCs! I was not going to let them bring all of them on the adventure. Twenty-eight PCs are plenty to try to funnel through in 2-4 hours. So, I allowed them to use three of their four characters. BUT…I did NOT let them choose which three to keep or which one to leave behind. I had two ways to determine whom they would get to keep and which one they would have to kill. I gave them two choices. 1) Number their PCs from upper left to right and then lower left to right, OR 2) Number them how they would like to. They choose … randomly. I then threw a d4, it landed on “3” and whichever PC had the number “3” marked by it was DEAD! My group loved this! I heard groans and I heard cheers. Some obviously lost what they thought was going to be a great PC and others were glad that their unlucky PC was out of the game before it started. With 30 PCs now ready to go, we set off to join the wedding party. The marriage of Ivy Newcombe and Tum Dankers with their families and invited guests proved to be a joyous occasion celebrating the union of two Suffolk of the Shudder Mountains. The party afterward was even better than the wedding according to most of the attendees. It was a foot stomping, toe tapping wild wing-ding. Son Carver and Clim Wills worked hard at dishing out heaps of food and poured drinks from jugs of good, strong stump whiskey. One swig from a particular odd colored jug did the group in. It burned straight down and left a taste of ginger lingering in the mouth. This is where I left the players and their PCs. I told them that their PCs find themselves lying face down in dried up brown grass. Monica, Lucia, Harold, Spad, Sped, Spid, Facebook, Instagram, Twitter (named by an 11 yr old), Shackleton, Yarlesburg, Podrick, Clarence with Billy the goose, Chuck, Job, Raven, Telly, Karen, Stalord, Zantz, Demize, Eustice, Turk, Durk, Paul, Elija, Harry, Frances, Harriet and Truman raise their heads and looking around, they find that they are no longer at the wedding. Heads feeling a bit awash, and nothing but old run down log cabins, a dried up corn field, and a dense forest surround them. With the first surprise of the Hobbs phantoms, Job, Harold, Spid, Telly, and Raven succumbed to the deadly grasps. All of the other PCs ran to the closest log cabins for cover. Six PCs: Eustice, Elijah, Karen, Harry, Shackleton, and Lucia enter what they thought was a safe haven and immediately succumb to death by the most horrific of acidic juices. There is always one in the group, who likes to take off on their own, but stay within earshot of the group. I did allow this, but of course, in the end, the PC succumbed to death. But not after he had another PC join him for one last “Hurrah!” What was hilarious of this attempt to be heroic was the fact that neither one of the players could roll any DC checks. One attempt to discover something really cool was met with the other PC standing in the middle of the burial ground clapping their hands. For what reason is anyone’s guess. But it left 10 players roaring with laughter. 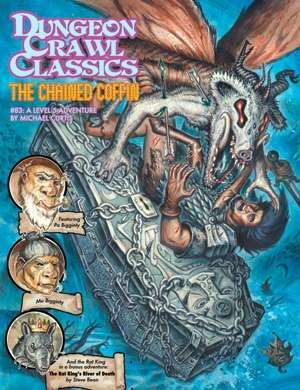 To me…this is Dungeon Crawl Classics! As I do not want to give too many spoilers, I will come to the conclusion. I found that with a group of 10 players, it was a handful to keep track of who died. Keeping track of who died is pretty important in this game module. It affects certain appearances of ‘monsters’. With more than 5-6 players, pre-gen characters are preferable. Yes, players do want to learn to roll up characters and I do like teaching this mechanic. But I’ve learned, the next time I see more than six players coming to my table…I will pull out the pre-gens. Purple Sorcerer here is to you! For the new Judge, I’m giving myself grace and find that my players are great at helping me along. And last, it is always fun to hear “My favorite part was…” And each player had their favorite part. When you can do that in a game, you’ve done it right.